This brief clip hints at new views on partnering, including the wind and a couple of butterflys that literally flew in during one of the interviews. Thanks to Jim Dennis for his friendship and support. Early in my climbing career he spent endless hours climbing with me on the classic alpine routes in the Sandia Mountains. His generosity and patience directly influenced my alpine interests and continue to do so today. Jim is a man of great courage. Shortly, after filming him, he donated a kidney to his son. Thanks also go out to Dave Wheeler for all the times we climbed together and for making Sugarloaf's "Chickenhead Ranch" pitch so much fun. Many years ago, Dave and his comrades were the third team to successfully summit Mt Blackburn. His stories always make me laugh and I continue to be inspired by his accomplishments both in the mountains and in the chemistry lab. This past weekend, Rocky Mountain Theatre for Kids debuted, The Phantom Tollbooth,. With two minor roles in this production, Alison had the chance to focus on group dynamics in her acting roles as both a Lethargarin and a Demon. Out of the summer repertoire, this was my favorite production because the storyline was part comedy, part fairy tale. The fanciful sets, psychedelic lighting effects and outlandish costumes, created a wonderful world of make-believe. This summer one of my major goals was to complete the Triple Crown up in Rocky Mountain National Park. On Saturday, August 11th everything fell into place. I was super psyched to aggressively attack this objective. The weather forecast predicted a hot clear day. 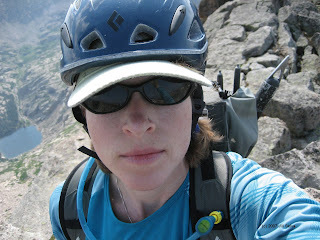 Starting at the Glacier Gorge trailhead at 4:00 am, I wasted no time huffing it up to Black Lake in 1.5 hours. Along the way I passed two separate hikers. Feeling focused, confident and very strong it felt like I was floating up the granite slabs reaching Stone Man Pass at 7:15 am. By now the sun had come up and it was already heating up. Keep moving, keep moving, keep moving, I said to myself. Up, and up I climbed continuing to float upward, reaching McHenry’s summit at 7:45 am. After a quick break, I quickly descended working my way over to Chiefs Head. For some reason a steep gully looked sweet so I scrambled up it. 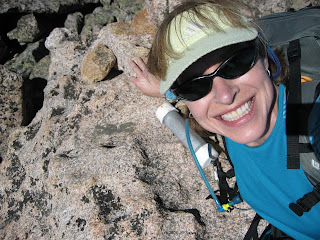 After scrambling under a gigantic, multi-toned chock stone doing class 4+ moves, I reached the ridge. Cruising the talus I reached the summit at 10:15 am. The great rolling divide lay before me and I quickly made my way over to Mt Alice. This last climb (or so I thought) required concentration. The terrain is class two, but when you’ve just pushed yourself hard and are still going big you’ve got to keep moving and stay focused. Wow, suddenly I topped out at 12:08 pm. Yippee…that’s three-13ers. Well, I was only halfway done. It’s never over until I am home in the shower. Down, down, down I went…back over the undulating divide. Mmmm…. but how to get back over to the Stone Man without losing a bunch of elevation? I could not easily see which gully was the best. Making a decision, I descended a fair bit down toward Lake Powell, only to be cliffed out. Oh rats! My only choice was to ascend and choose an alternative route. The heat was relentless and suddenly my Platypus reservoir was empty. Mmm…. 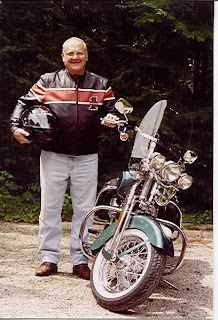 my back had been very wet since Chiefs Head – could it have been a leak.? My mind didn’t want to go there and nothing could be done about it at the moment. Choosing gulley #2 I descended way down toward Lake Powell and then skirted a few mini-snowfields. It was at this point, I started to feel the bigness of the day. Stopping to catch my breath, I sized up my Stone Man (I love him) and then put my head down and climbed fast, like a horse trotting back to the barn. At the top of the pass my tongue was sticking to the roof of my mouth. Water, water, give me water. Remembering there was an apple in my pack, I sat down and devoured it. Yum, ah, juicy….enough to pep me up and get me down to Spearhead. The huff out was uneventful – though it seemed epically long. My roundtrip time was 14 hours, 15 minutes. My first preference would have been to complete this huge cirque of McHenrys Peak, Chiefs Head Peak, and Mt Alice with a good friend. Note: When I unpacked my backpack, it was evident that my Platypus reservoir leaked. The entire contents of my backpack were soaked, including my first aid kit. When I refilled the reservoir it gushed water out the bottom through a crack in the plastic. Whew! Another walk in my park. It is with great sadness that I post this blog entry. Yesterday, our faithful furry companion was relinquished. Frosty was a sweet and gentle cat, and a one-of-a-kind mongo-shed-machine. We loved her. I will miss her kitty-isms, especially the way she would greet me at the door after a long day at work or in the mountains. She followed me around the house and patiently listened to all the stories of my adventures. We (Alison and I) dedicate this blog entry and the amateur short film to Frosty. We miss you. Hans Florine was gracious enough to round out another 16-hour day on his tour by granting me an interview. Without a doubt he is “Mr High-Energy”! We enjoyed swapping stories about our public speaking gigs as well as aerial dancing. After spending some time with him, it’s easy to understand why he is the king of speed....going fast is always on his mind. In October 2005 I traveled to New Mexico for a short series of interviews. Learning by trail and error, I hung out at Palomas Peak with many friends, climbing, and also video taping conversations and interviews. Here is a short clip of Carla Rachkowski and Cristina Radu talking about "Sudden Partnering". Behind every successful woman, there is a strong, talented, wise and successful dad. Today is my dad's birthday. Here’s a few tidbits about him. Happy birthday day dad! Eat lots of cake! Up early and out the door – enroute to my park. Early on, two fat bunnies hopped across the trail. These were the biggest bunnies I’ve ever seen. Near Black Lake a large, brownish marten sauntered onto the trail, stopped and stared at me…point blank…with an expression that seemed to say…what are you doing up here? Up, up, up into the large and empty Glacier Gorge basin. I heard one party on Spearhead but couldn’t see them. Up, up, on the granite rubble, I worked my way across the lunar landscape; feeling small and fragile within the vastness of this place. Looking upward at my Stone Man…..I slipped deep into thought about my personal business plan, Jilly Inc. Ascending steadily, I climbed up, up, up mixing class 2, 3, & 4 moves together. One can pick their line and do as they please while dancing up the rock to McHenrys summit. This is what I like about going big and hanging it out in the park. There is an endless array of options. After spending some time on the summit, taking in the scale and beauty of where I was, I started my descent….deep in thought. The word recreation swirled in my head. Late last week, it occurred to me….for the first time…that this word means to re-create. How brilliant in its simplicity! We “recreate” to “re-create”. What is it that we are all re-creating? We re-create our vibration, restoring it to its natural level…the one we come in with …. a vibration that is stress-free and joyful….a loving essence.